If you’re shopping for welding gases in Mississauga, it’s worth it to put forth a little bit of effort before you sign a contract. The right supplier will help you watch out for your bottom line and become a true partner in your business success. There are many questions to ask your welding gas supplier, but one of the most overlooked of those questions has to do with disposal charges. The disposal of welding gases in Mississauga must meet several regulatory guidelines, in other words, they have to be disposed of in a certain manner! You can’t just take a canister and toss it in the garbage bin or recycling unit. Instead, your gas vessels need special treatment – and you may be the one paying for it. You may have noticed that many suppliers try to pass along the cost of these special considerations to you, the buyer. They show up on your bill as hazardous materials or environmental charges or fees. Sometimes, these charges show up on every order. When you need welding gases in Mississauga, remember to ask about any extra charges that may be linked to the purchase of your products. Whether you need shielding gases, pure gases, or mixtures, look for suppliers that focus on advancing your operation’s efficiency and productivity. Suppliers of welding gases in Mississauga have the potential to be a true partner to your business, helping improve your products and services and maintain your bottom line. You can expect a high level of customer service every time and a real concern for your business success, as opposed to a supplier who is only interested in making a quick dollar. Mixes: There are many types of mixes available, and some are branded. Be sure to request certification of the mix from the Canadian Welding Bureau before you buy. Pure Gases: Ask for a comprehensive list of all of the pure gases available at the supplier so you know where to go if you ever need a special gas for a different project. Josef Gas is the only supplier of welding gas in Mississauga you need. Our easy process ensures you have the right gas and the right amount of gas on hand all the time. Not sure what you need? That’s not a problem! We have representatives on staff that have formal schooling in welding and can help you with technical advice and expertise! 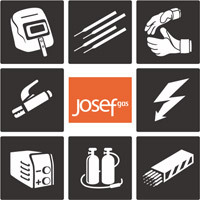 Contact us at 416-658-1212 or email info@josefgases.com to receive a custom quote today!